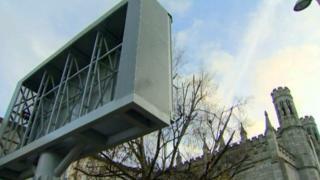 A council is to repay funding of more than £23,000 to a government department following a scheme that saw a large TV screen erected without proper planning permissions. In 2015, Newry, Mourne and Down Council erected a large screen beside Newry Cathedral. The Catholic Church said it had not been consulted about the screen and that it was a breach of planning rules. Planning permissions were overturned and the screen was taken down and sold. At the time, Canon Francis Brown, from Newry Cathedral, told the BBC that the church and parishioners were "delighted" with the court's decision. The council will now have to pay back £23,193 of funding to the Department for Communities after the department deemed the original payment "irregular". The payment is set for approval at a meeting of Newry, Mourne and Down Council on Monday.